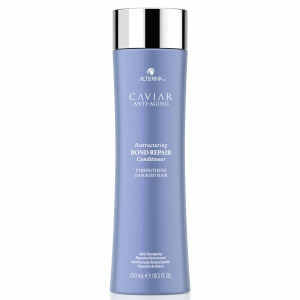 Restore and repair damaged hair with Alterna Caviar Anti-Aging Restructuring Bond Repair Shampoo, a restorative formula that gently cleanses while strengthening vulnerable hair. Formulated with Caviar Bond Enforcing Technology, the strengthening shampoo expertly lifts away dirt and impurities while sealing hair cuticles that have been damaged through chemical processes or physical stress. Its dose of Caviar Extract (one of nature's richest sources of Omega-3 Fatty Acids) helps restore moisture, elasticity and shine back into lack-luster locks. Rebuilding and protecting strands to prevent breakage, it also contains a proprietary Age-Control Complex, which nourishes and provides antioxidants to encourage healthy-looking hair, plus a vegetable-derived protein and silicone blend for added strength and resilience. Water/Aqua/ Eau, Disodium Laureth Sulfosuccinate, Glycerin, Sodium Lauroyl Methyl Isethionate, Cocamidopropyl Hydroxysultaine, Cocamidopropyl Betaine, Acrylates/Vinyl Neodecanoate Crosspolymer, Fragrance (Parfum), Glycereth-26, Glycol Distearate, PEG-175 Diisostearate, Benzyl Alcohol, Sodium Lauroyl Sarcosinate, Cocamidopropylamine Oxide, Aminomethyl Propanol, Citric Acid, Silicone Quaternium-16, Hydrogenated Castor Oil/Sebacic Acid Copolymer, Hydroxypropyl Guar Hydroxypropyltrimonium Chloride, Hydrolyzed Vegetable Protein PG-Propyl Silanetriol, PEG-45m, Dehydroacetic Acid, Butyloctanol, Undeceth-11, Undeceth-5, Polyquaternium-7, Ascorbic Acid, Butyrospermum Parkii (Shea) Butter, Helianthus Annuus (Sunflower) Seed Oil, Linum Usitatissimum Seed Oil, Polysilicone-15, Superoxide Dismutase, Tocopheryl Acetate, Alaria Esculenta Extract, Caprylic/Capric Triglyceride, Hydrolyzed Rice Protein, Caviar Extract, Potassium Benzoate, Propylene Glycol, Sodium Sorbate, Leuconostoc/Radish Root Ferment Filtrate, Saccharomyces/Copper Ferment, Saccharomyces/Iron Ferment, Saccharomyces/Magnesium Ferment, Saccharomyces/Silicon Ferment, Saccharomyces/Zinc Ferment, Phospholipids, Hexyl Cinnamal, Linalool, Limonene, Geraniol, Coumarin, Citral, Amyl Cinnamal, Benzyl Benzoate, Benzyl Alcohol, Citronellol.